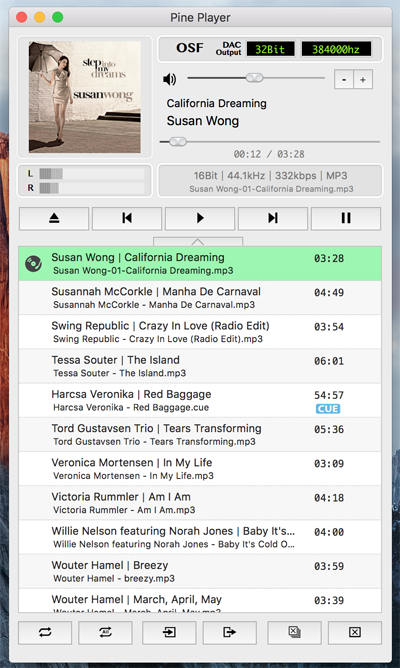 Pine Player is an exclusive listening digital music player for music lovers who use the OSX operating system. It can play almost all existing digital audio forms such as MP3, FLAC, APE, AAC, M4A, WAV, AIFF, OGG, WMA, DSD etc. and it also has a strong playing capability for listening to CUE files in the most convenient way. Pine Player supports various kinds of PCM formats, so it can play sound sources from 16 to 32 bit; it can also reproduce clear and abundant sound quality by supporting a maximum of 768kHz. Pine Player’s unique Over Sampling Filter is a technique that upconverts an ordinary MP3 file into a 32bit, maximum of 768kHz, and high sound quality sound source and sends it to the DAC for it to be played in best performance. Ordinary MP3 files’ sound quality can actually be heard more clearly and plentifully. Obviously, HD audio files such as MQS and DSD can be upconverted to a maximum of 768kHz as well. Pine Player has a very convenient playlist because users can save and manage the music they wish to listen to, change the order of the music being played by simply dragging, and express any kind of language or text encoding perfectly because of its flawless decoding function. There is no Korean code cracking. Cross Fade function, which is a technique that decreases the gap between songs when listening to files on the playlist or overlaps the songs for no gaps at all, can be set into seconds. Pine Player prevents damage of sound quality by having a high-powered Audio Queue for processing excessive amount of digital data. Therefore, it takes a considerable amount of memory compared to other music players. Pine Player has an automatic isolation function for damaged sound sources called Vault. If a damaged sound source is detected while playing the music, the music is stopped and taken to the Vault file for isolation. Through this convenient function, users can easily figure out which sound source is damaged and restore it. Even with all these functions, Pine Player is a free app. Moreover, there are not any marketing or advertising material. Especially, no information including personal ones are sent to the outside or the Internet. Pine Player는 OSX 운영체제를 사용하는 음악 애호가를 위한 디지털 음원 감상용 재생기 입니다. MP3, FLAC, APE, AAC, M4A, WAV, AIFF, OGG, WMA, DSD 등 현존하는 거의 모든 디지털 오디오 형식을 재생할 수 있고 가장 편리한 방법으로 CUE 파일을 감상할 수 있는 강력한 재생기능을 가지고 있습니다. Pine Player는 다양한 PCM 포맷을 지원해서 16에서 32Bit의 음원을 재생할 수 있고 최대 768 KHz의 샘플링을 지원해서 선명하고 풍성한 음질을 재현합니다. Pine Player 특유의 Over Sampling Filter는 일반 MP3 파일을 32bit와 최대 768kHz의 고음질 음원으로 업컨버트하여 오디오기기(DAC)로 전송하여 최대의 성능으로 음악을 재생할 수 있도록 도와주는 기술입니다. 실제로 일반 MP3 파일을 재생해보면 음질이 더욱 선명해지고 풍부해지는 것을 느낄 수 있습니다. 물로 MQS, DSD와 같은 HD 오디오 파일도 최재 768kHz 업컨버트 가능합니다. Pine Player는 편리한 재생목록 기능을 가지고 있었서 감상하기 원하는 곡들을 저장해서 관리할 수 있고 재생 순서 또한 드래그로 바꿀 수 있고 또한 완벽한 텍스트 디코딩 기능으로 어떤 종류의 언어와 텍스트 인코딩도 완벽하게 표시해 줍니다. 한글코드 깨짐 현상이 없습니다. 재생목록의 파일들을 재생할 때에는 곡과 곡사이에 갭을 줄이거나 오버랩하여 끊김없는 재생이 가능하도록 해주는 편리한 Cross Fade 기능을 초 단위로 설정할 수 있습니다. Pine Player는 내부적으로 업청난 양의 디지털 데이타를 처리하기 위한 강력한 Audio Queue를 가지고 있어서 언컨버팅 시의 음질 손상을 방지해 줍니다. 때문에 다른 음악 재생기에 비해 상당한 메모리를 사용합니다. Pine Player는 Valut라는 손실된 음원을 자동으로 격리하는 기능을 가지고 있습니다. 음원일 재생하던 중에 손실된 음원을 감지하면 재생을 중단하고 Vault 폴더로 이송해서 격리합니다. 이렇게 해서 사용자가 손실된 음원을 손쉽게 파악하고 복구할 수 있는 편리한 기능입니다. Pine Player는 이런 기능을 제공하고도 완전히 무료 프로그램입니다. 또한 광고나 마케이팅 자료도 포함되어 있지 않습니다. 특히 개인 정보를 비롯한 어떠한 정보도 외부나 인터넷으로 전송하지 않습니다.